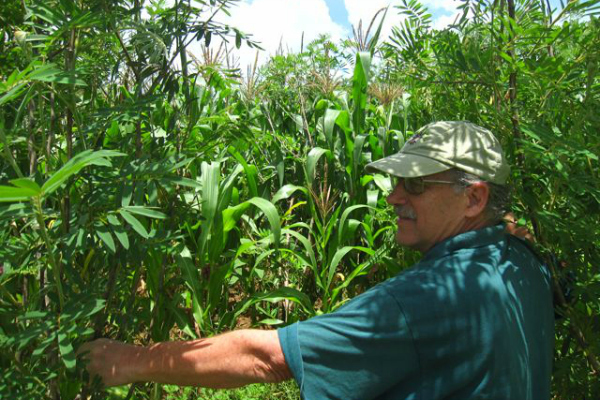 Roland Bunch, an agro-ecologist, in Malawi. Roland Bunch was Director of Sustainable Agriculture and Rural Livelihoods for World Neighbours and is the author of “Two Ears of Corn: A Guide to People-Centered Agricultural Improvement”, available in 10 languages and used by more than 60 universities and organisations. Bunch is Groundswell’s Mali Program Coordinator. He specialises in agro-ecological practices and the design of agricultural development programmes, with a focus on training rural residents. The road north from Segou, Mali, is a breathtaking experience: few other drives show how fertile farmland gradually turns into forbidding desert. The well-kept highway shoots through the Sahel, offering increasingly dry vistas. Segou’s maize fields are soon replaced by millet, which is more resistant to drought, then by thorny scrub. By the time you cross the Niger River at Timbuktu, you have officially entered the Sahara Desert. Nothing but sand and rock remains. Today, Mali mostly evokes war. Al Qaeda’s push for southern Mali, stopped by French forces, had at least one effect which its commanders surely did not expect: the outside world has become acutely interested in the western Sahel. Large flows of fresh aid money, including 5 billion from the European Commission, have been pledged. But as I was driving up that road in late 2011, militant Islamists were the last things on my mind. A drought had hit the country earlier that year – and that wasn’t supposed to happen. The Sahel used to experience droughts roughly every ten years. There had been one in the mid 1970s, and then a terrible one in 1984-85 (that one prompted Bob Geldof to organise Live Aid). Other droughts came in 1994 and in 2003 – par for the course. But then things speeded up. Drought came in 2005 and 2009. Just two years later, we were experiencing yet another. Over the centuries, the peoples of the Sahel have evolved complex customs to help them survive these occasional catastrophes. Tradition dictates that people must share their food with the least fortunate. Strict rules govern the use of water. Transgressions are harshly punished. Just up the road, in the Sahara, a person that draws water for his animals before allowing someone else to draw water for his family is guilty of a crime worthy of death – even if the well was his. So says the unwritten law of the desert. North of Segou, people used to sell animals, plows and kitchenware in drought times. The money would allow them to buy food. In effect, families drew down savings accumulated during good years. After the drought, people would gradually rebuild their assets. By the time of the next one, ten years later, they would have accumulated enough for the cycle to be repeated. So it had gone, for centuries. But with droughts suddenly hitting every two or three years, this system has broken down. People have nothing left to sell, and no one has enough to share with others. In such exceptional droughts, starvation looms. In 2011, the worst was only avoided by massive food aid – something the world may well tire of doing again and again. November is harvest time. In the October of our visit, we should have been driving past tall sorghum and millet stands loaded with grain. Yet, for mile after depressing mile, all we could see were stunted plants, none more than sixteen inches tall. Most of these fields would fail to even replace the grain sown there. Serious trouble loomed. A clue came from a trip I took to Mali’s Dogon country in 2009 – another drought year. One famous Dogon group has lived for centuries in homes carved out of some of the highest cliffs to be found in West Africa. The spectacular setting of these villages had a defensive purpose: just pulling up the rope ladders protected people’s women, animals and tools from raiding parties. The Dogon live across a huge area, most of them well away from the cliffs and its tourists, and it was such a remote area, near Koro, that I was visiting to assess an agricultural aid programme. Around the villages northeast of the town, the crops were looking amazingly good, even though drought was raging. Then I began noticing the trees. They were everywhere, all over people’s fields. And they were all shaped into narrow, tall, inverted cones, very unlike the famous flat-topped African acacia trees. I also began noticing that, intercropped with the millet, people were growing patches of cowpeas, peanuts, fonio and Bambara nuts. These crops, too, were doing well. “Yes. The cowpeas and the Bambara nuts fertilise the soil, as does the fonio.” Most of these crops are legumes that fix nitrogen, thereby supplying the plant a vital nutrient, the lack of which is responsible for much of the Sahel’s low crop yields. Fonio, however, is a grass. It doesn’t fix nitrogen, but it produces a tremendous number of roots. This, too, is important: when they die, the Fonio roots provide a huge amount of essential organic matter to the soil. “It’s the trees,” one man said. “Furthermore,” another man injected, “the crops do better in the shade, as long as there isn’t too much. They don’t like being out in the terrible heat all day, any more than we do.” And he was absolutely right. All lowland tropical crops without shade stop growing for two or three hours in the middle of the day because it becomes too hot for them to continue functioning. “Ah, so that’s why you have all those trees in your fields,” I added appreciatively, just to encourage them to tell me more. One of the reasons I love agronomy is that I learn something new almost every day of my life. This method of pruning trees could be useful virtually anywhere in lowland, drought-prone Africa, which comprises something like 30% of the entire continent. The Dogon of Koro had found a simple, inexpensive solution to farming in a drought-prone zone. In the last 20 years, rapid population growth has meant that the average African farm family is left with less than 2 hectares of land. This makes fallowing impossible – there is not enough land to let trees or grass grow back to fertilise the land with their organic matter. The system used to keep the soil fertile for at least 2,500 years is now in its death throes. As the organic content of the soil decreases, it gets harder, forming a think, slab-like crust. Instead of infiltrating into the soil, 90% or more of any rainwater just washes off. The little water that does remain, wetting the soil to a depth of 1 or 2 cm, evaporates within a couple of days in the hot sun. Starved of water and nutrients, devoid of organic matter, the soil turns into desert. The only durable solution is to plant a combination of plants that fertilise the soil and boost its organic matter right along the cereal crops, like the Dogon’s use of cowpeas, Bambara nuts and fonio grass in their millet fields. These provide people with food while acting as a fallow at the same time. The increase in organic matter allows rainwater to sink into the soil and boosts its ability to keep that water within the root zone of the crops. These densely planted intercrops and the native trees that have been left in the fields shade the soil, thereby helping the soil to maintain all that extra moisture. So why did those few fields along the highway north from Segou grow so well? Virtually all African farmers know that cow and goat manure is good for their soil. Each year before the rains come, they carry tons of this material out to their fields. But none of them has enough to fertilise all their fields. Therefore, they tend to apply nearly all the manure near their homes, because the impact of the manure is about the same wherever they apply it, but the transportation costs are lowest for the fields nearest the village. And, of course, there tend to be more trees near the villages, too. Once fields have plenty of manure, the rainwater penetrates the soil, rather than running off, and the organic matter, along with the tree shade, helps maintain the moisture in the soil. In their own way, in a few fields right near their villages, these people had recreated the Dogon system. And once again, where they had done so, the effects of the “drought” had vanished. So the rapid increase in the impact of droughts over the last 15 years is not primarily caused by a decrease in total rainfall. Rather, it is due to deforestation and the decrease in soil organic matter, caused by the slow death of fallowing. If we can change these two conditions, the Dogons of Koro won’t be the only Sahelians who produce bumper harvests right in the middle of the Sahel’s infamous “droughts”. Is it realistic to hope so? Decades of support has seemingly done little to dent the pervasive poverty affecting the country and its neighbours. This would suggest that pessimism is in order. But the link between poverty and extremism has long been recognised. For example, the EU’s External Action Service addressed both security and development in its 2011 Security and Development Strategy for the Sahel. And last year’s push into southern Mali by AQIM and the consequent French intervention focused minds. In November, the Commission proposed a vast new aid package for the Sahel worth 5 billion euros. Resilience and agriculture and food security are duly mentioned. And a plethora of initiatives, from the Great Green Wall to AGIR-Sahel, also deal with the root cause of the country’s underdevelopment. Whether that flood of fresh money does some good will depend on one thing about all: whether donors and aid workers understand the dynamics of farming in the Sahel’s drylands, and learn to integrate locally evolved and adapted solutions in their remediation programming.